For a generation that grew up reading Ezra Pound and Charles Olson, the verse novel looks anachronistic. The verse-novel is not the long poem in its contemporary manifestation. This is, of course, related to collage modernism and the citational fragment, but it is also how – after Louis Zukofsky’s ‘A,’ Charles Olson’s Maximus and Rachel Blau DuPlessis’s Drafts – we read long poems as long poems. It’s how readers have adjusted, and grown accustomed to, expansive poetics and the pleasures of disjunction. For readers and practitioners of the long poems in Australia, The Ash Range is a founding text (even if one resists it). Its documentarian capacities also make the recent plagiarism affair look like a tiny blip in the enormous history of poetics (think Reznikoff’s large, triumphal, two-volume work of long poem plagiarism in Testimony, covering the years 1885-1900). D.K. : Original idea of the 'one-note Samba'? also on Festival E.P. K3011. The documentarian poem asks precisely this: what role do the minutiae of culture play within the broad stroke? Painters who have ever tried using a very large canvas might be struck with a sense of vertigo on perspective. In a similar way, the structures of this book form a larger geometry such that every part of the canvas – even the tiniest details – are crucial to the final perspective. While endlessly incomplete and always hermeneutically unfinished, collagistic and citational long poems are such an exercise in scale and perspective, in building wholes from parts and parts from wholes. Yet there is always the pleasurable sense of excess in the long poem, a refusal of ends, a welcoming of capacity and continuation. Disjunctive poetics affords pleasure for all the senses. Whether this is a weather report or a traffic report, the poem as social record / observation here gets some serious air. Gapping is scopic scansion: the presentation of space that is an unmistakably experimental gesture. Indeed, it’s fair to say that Duggan has always been an experimentalist, a poet interested in difficulty, in area, trace, field, mark, in drafting, proofing, testing, recording. Experimentalism is, of course, now a very broad church in contemporary Australian letters – and a thriving one. Experimental writing at its best is radically populist and radically accessible. Experimental writing courts the average reader. We’ve all seen how, after a night of drones, an experimental poet comes out to read, wielding the vernacular, and the room lights up. There’s laughter, joy, play, confusion, affirmation, all the things that make poetry what it is. This is why poets in the generation including Duggan, Pam Brown and Ken Bolton are so accessible to readers and listeners, because of their interest in the page-as-field (perhaps an ‘Olsonesque’ sense), and the everyday vernacular. The only reason Conventional Verse Culture still claims to own the (ever-elusive) ‘average reader’ is because of the structures and frameworks in place that tell people they do. This is not because people on the street speak like CVC. Finally, the exilic quality of Duggan’s writing – he is an expat to the UK – gives us the sensibility of the long poem poet as one who is always in exile, always decentred. 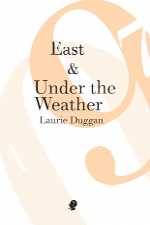 My wager with Duggan’s work is that it is really all one immense long poem, a work in process (and always process, experiment), whose open, disjunctive and decentred structures stand corporeally inside time and culture, but stubbornly outside of Nation. Perhaps it’s better to be on the outside looking in than on the inside looking out. This entry was posted in BOOK REVIEWS and tagged A J Carruthers, Charles Reznikoff, Laurrie Duggan. Bookmark the permalink.